Arrive to Tashkent early in the morning; meet in airport transfer to the hotel. Afternoon beginning guided tour Tashkent visits (old part) Hast Imam Square, Kaffal Sashi Mausoleum, Barak-Khan Madrassah where the world's oldest the Uthman Qur'an is kept, Juma Mosque, Tillya Sheikh Mosque Kukeldash Madrassah and Chorsu bazaar. Dinner in local restaurant. City tour Tashkent continues and visits (new part) Mustaqillik Square (Independence Square), Museum of Fine and Applied Arts, Theatre Square, Amir Temur Square, Monument to Courage, Bunyodkor Square (former Halklar Dustligi Square) with Abul Kasim Madrassah and Tashkent metro station. Late afternoon transfer to airport flight to Urgench (HY1057 dep at 18:00 arr at 19:40), on arrival transfer to Khiva (30 km), the fairy-tale like oriental town. Dinner and overnight at hotel. Full day guided tour Khiva visits Monument of Al Khorezmiy, Muhammad Amin Khan Madrasah & Kalta Minor, Palace Complex Kuhna Ark: (Korinishona, Winter & Summer Mosque and Ak-shikh-bobo), Muhammad Rakhimkhan Madrasah, Pakhlavan Mahmud Mausoleum, Shergazi Khan Madrasah, Minaret and Madrasah of Islam-Khodja, Djuma Mosque, Ota Darvaza "Father Gate”, Ak Mosque, Anushakhan bath-houses, Palvan Darvaza ‘’Warriors Gate’’, Alakulihan Madrasah, Qutlugh Murad Inaq Madrasah, Caravansary Tim Allah Kuli Khan with bazaar and Tash Khauli Complex. Dinner in “Toza Bog Palace’’ (summer residence of Mohammed Rakhim Khan II) with folk show. Full day guided tour Bukhara visits remaining of city wall and gate of Bukhara, Samonid's Mausoleum, Chashma-Ayub Mausoleum, Kosh Madrasah Ensemble (Abdullakhan Madrasah & Modarikhan Madrasah), Bolo Khauz Mosque, Ark citadel & Zindan (ancient prison), Khodja Zaynuddin Complex, Poi Kalyan Complex: (Kalyan Minaret, Kalyan Mosque & Miri Arab Madrasah), Trading Dome: (Toki Zargaron, Тoki Telpak Furushon & Toki Sarrafon), Ulugbek Madrasah, Abdullazizkhan Madrasah, Khodja Gaukushan Ensemble, Magoki Attoron Mosque, Architectural ensemble Lyabi Hauz (Kukeldash Madrasah, Khanaka and Nodir Devan-Begi Madrasah) and Synagogue. This evening you attend a traditional Bukhara cultural folk show. Today visits Mausoleum of Bahouddin Naqshband, Summer Palace of last Emirs Sitorai Mokhi Khosa and Chor Bakr necropolis. Afternoon is free. Dinner in local house. 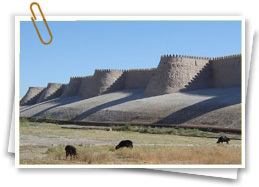 After breakfast drive to Samarkand, often called the "Rome of the Orient", en route visit Shakhrisabz. During of the tour you will visits remnants of Ak-Sarai Palace, Bazaar of Shakhrisabz, Kok-Gumbas mosque, Khazret-Imam mosque (Dorut Tilyavat ensemble, XIV century) and Gumbazi-Seidan mausoleum (Dorus-Siadat ensemble, XIV century). Arrival to Samarkand, check-in to the hotel. Dinner in local restaurant. Full day guided tour Samarkand visits Ensemble of Registan: (Ulugbek, Sher Dor and Tillya Kari Madrasah's), Gur-Emir Mausoleum (graves of Tamerlane and his descendants), Rukhobod Mausoleum, Aksaray Mausoleum, Bibi-Khonym Mosque with Siab bazaar, Shakh-i-Zinda Ensemble, Khazrat-Khizr Mosque, Aancient settlement Afrosiab with Museum, Mausoleum of Khodja Doniyor (Prophet Daniel) and observatory and memorial museum of Ulugbek. Dinner in local house. - Accommodation in Double or Twin bed room. - Meals plan as indicated (B-breakfast, L-Lunch & D-dinner). 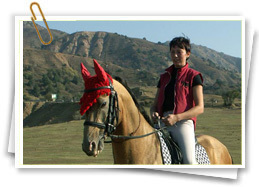 - All sightseeing as per the itinerary. - Entrance fees to monuments and cultural events. - All over land transportation by transport with air condition. ► for 2 Persons – car. ► from 3 – 7 Persons min bus with 9 seats and 14 seats. ► from 8 – 14 Persons mid size bus with 18 and 30 seats. ► from 15 Persons bus with 30 seats and 45 seats. Japanese and Russian speaking guides. - One bottle mineral water (1,5 liter) per person every day. 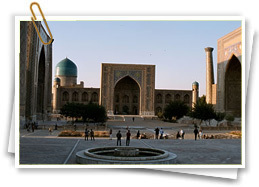 - Air ticket Tashkent – Urgench 96 US$ per person. - Luggage in excess of 20 kg (44lbs). - Tips for driver and local guide. - Video & photo camera charges during sightseeing. Children ages 0-4 free of charge.